The 1974 version of Atlas Comics (from Seaboard Publishing) was another attempt to compete with Marvel and DC that did not last long. No comic or magazine they put out lasted more than four issues. 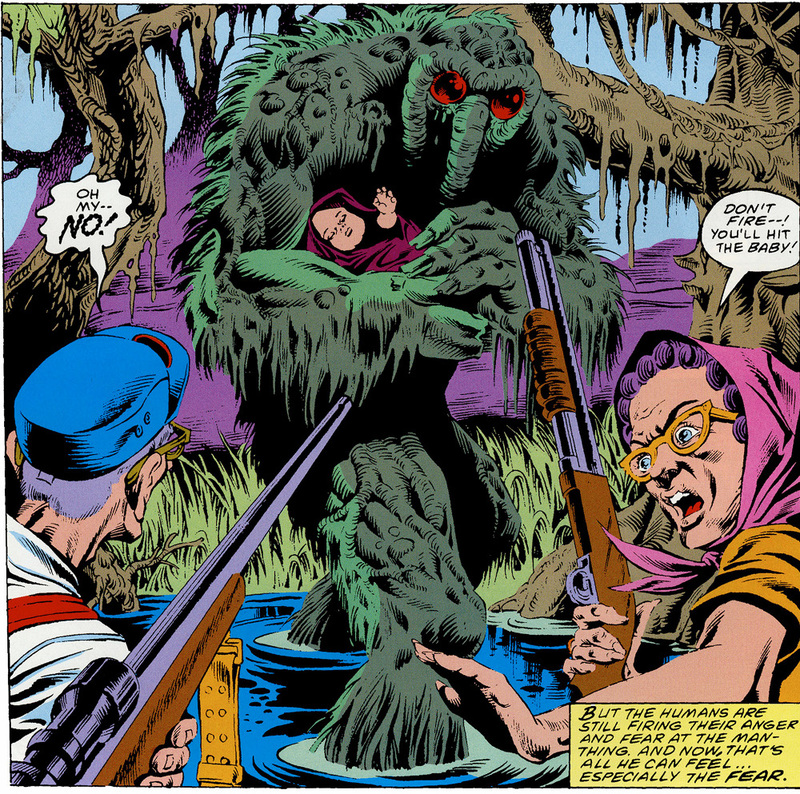 As there was apparently some sort of mandatory swamp monster requirement for every seventies comic publisher, they introduced their own. Meet the Bog Beast. The Bog Beast is very different from other swamp monsters, so much so that I seriously considered not including it in the Muck Man list. But there are similarities. Bog Beast has been sent by an underground civilization to investigate the surface world, emerging from the La Brea tar pits. It looks like an emaciated human, bubbling over with tar. In the color stories, it is red, about as far from the green or brown of most other swamp creatures as possible. It is also an intelligent, self-aware creature. It has not been transformed, there was no fiery explosion that killed an otherwise normal human. It is not a typical member of its species, but as “The Sun-Spawn Walks” shows, it is one of the fittest members of its subterranean civilization. The Bog Beast is not, and never has been dead, nor was it ever human. There was no catalyst for its transformation, because there was no transformation. On the other hand, it is immune to bullets, and inhumanly strong. And sort of goopy-icky. But the Bog Beast is, similar to many of the muck men, an outsider, who observes humanity from a remove. So it sort of fits, and hey, there are only four stories. So here we go. Bog Beast started off in Weird Tales of the Macabre #2 (Mar, 1975), a black and white magazine reminiscent of Skywald’s mood horror titles. The initial story details an odd mix of a recently-fired Hollywood special effects technician, and a put-upon newspaper photographer. The photographer is assigned to the La Brea tar pits, and witnesses the Bog-Beast climbing out on its mission to explore the surface world. He gets mixed up in a Hollywood production, and of course there are life-threatening problems, which the Bog-beast both causes and then solves. Bog-beast thinks clearly, but it cannot communicate, due to the language barrier. That said, we've seen this story before. The Bog Beast invades a film shoot, in a manner reminiscent of a Heap story. When the rain machine goes haywire and causes a flood, the Bog Beast rescues a woman from drowning, as in the Glob’s initial appearance. 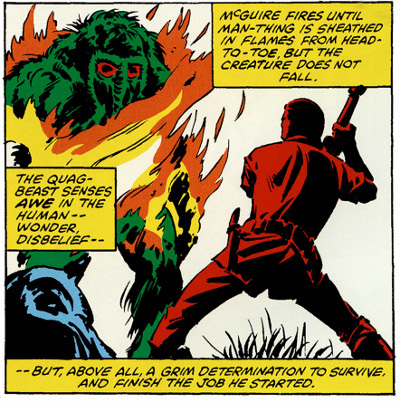 The Bog Beast appeared again in Tales of Evil #2 (April, 1975), and 3 (July, 1975), both in color. The first story, “The Fifty Dollar Body” is a crime story in which Bog Beast serves primarily as a passive observer. The Bog Beast runs afoul of two fugitives, a rather slow-thinking man, as well as a viciously unpleasant woman. Bog Beast tries to communicate with them, but fails. The Beast tangles with the cops, and eventually the two fugitives turn on each other. Bog-beast is freed by the fatally-wounded, who then dies himself. Bog-beast, bewildered by the very human cruelty, moves on. The final frame is very familiar, similar to Len and Bernie's famous "If tears could come they would" ending from the original Swamp Thing story. 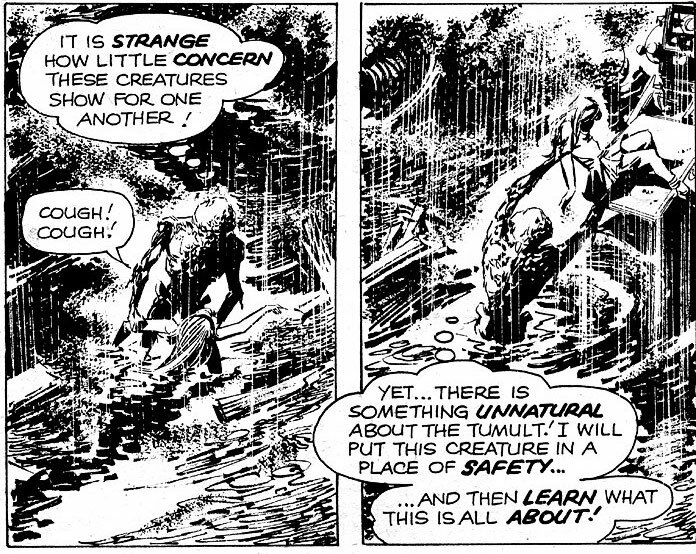 Bog Beast turned up again in Tales of Evil #3, in an untitled story. While visiting the Mount Palomar observatory, Bog Beast discovers bodies torn to shreds, and a woman still alive. She turns out to be a werewolf, and Bog Beast must fight her. Throwing her off a cliff, he attracts the attention of the police, who then net and capture him. This is the first fantastic story of the Bog Beast. Everything else has been noir or crime, but here we have our first story with supernatural elements. Swamp Creatures meet with werewolves often. Swamp Thing and both the Hillman and the Skywald incarnations of the Heap did. Likely the ferocity of the werewolf makes for a good opponent for the Swamp Monster: Although the werewolf is usually frenzied, the Swamp Monster is slow and tough. Few of them have been as appealing to male gaze, however. Atlas folded in 1975, and the Tales of Evil 3 was long believed to be the last Bog Beast story, the Internet has shown one that surfaces in an Australian anthology comic Fearful Spectres (1982) from publisher Gredown Comics. As far as I understand it, the story was likely sold since it was complete, and there was no sense it letting something that could bring in money go to waste, even if wasn't published under the Atlas banner. “The Sun-Spawn Walks” initially shows a new power Bog-Beast has not previously displayed. 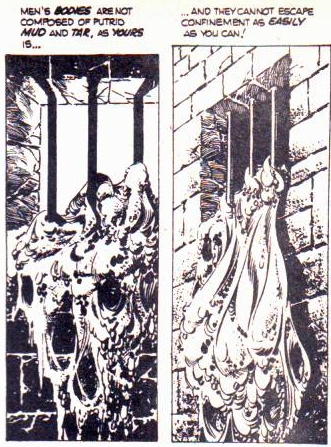 He is able to turn into a goopy, boneless form and flow through bars of a prison. And in a more comic-book story, Bog is attacked by an entity that seems to be made of living flame, and defeats it by turning to liquid form and smothering it. Although it's unlikely have influenced it, this story also has an antecedent to psychic girl "Casey" from the Pasko and Yeates Swamp Thng. Bog meets a woman who is deaf mute from birth, and has therefore developed telepathy. By the end of the story, she has been badly burned, and their psychic link is severed. Thus Bog is alone again. 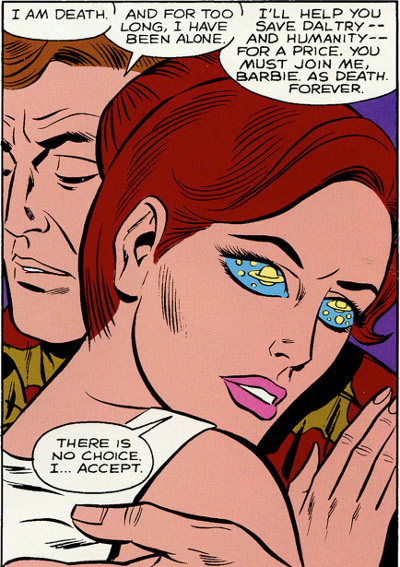 And that was the end of Bog, and the end of Atlas Comics. Unfortunately, Bog never developed doesn’t have much personality. This might be due to its bouncing around between writers (Gabriel Levy for its first appearance, John Albano for the second outing, Levy again in Tales of Evil and the unknown author of “The Sun-Spawn Walks”). It's tangential to the usual run of Swamp Monsters, but interesting to see the concept stretched, if not to the breaking point. 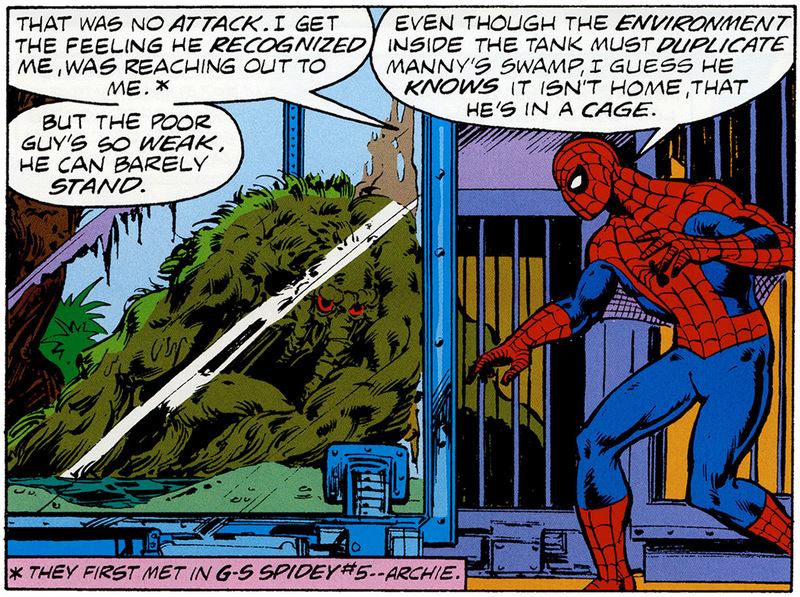 Next time, I'll be yammering on about the second iteration of Marvel's Man-Thing. See you then.